BACMM is honored to be the marketing company of choice by Skin So Loved for their entire line of advanced-technology skincare products (USA & internationally). As we grow older, facial skin does so as well, showing obvious signs aging including wrinkles, fine lines, thinner skin, loss of radiance, etc. Facial skin is not only sensitive to what we take in orally, but also reacts to the constant exposure to pollution, heat, artificial light, radiation, and other environmental foes. It is also evident in diminished appearance of people who are stressed and overtired. The skin becomes, dried out, saggy, and less supple. Skin So Loved Anti-Aging Serum is a unique and easy to use topical treatment designed to deliver both immediate and longer lasting benefits. Upon application, users will experience a noticeable simultaneous toning and smoothing effect that can last for several hours. Skin hydration is improved along with radiance and a more even and contoured appearance. Anti-Aging Serum provides both short term and long term benefits. Upon use, improvement may be seen within minutes. Regular use imparts a cumulative benefit to both protect and improve the skin’s appearance. Hydrolyzed Vegetable Protein: Caresses the skin, instantly allowing perceptible surface wrinkles and imperfections to lessen. It also enhances the cohesion (creating a bond or more united whole) of the exterior matrix of the skin cells which translates to a smoother looking appearance as fine lines and wrinkles may be diminished. Hydrolyzed Vegetable Protein is an excellent source of hydroxyproline. Derived from the non-essential amino acid proline, hydroxyproline is a basic and integral component of collagen and other structural proteins. The skin’s ability to heal is to a partial extent determined by the presence of hydroxyproline. Spilanthol: Is a naturally occurring phytochemical with anesthetic properties. Spilanthol is extracted from Acmella oleracea, and can help reduce muscle contractions and relaxes facial features. This phenomenon reduces fine lines, especially around the eyes and between the eyebrows at the bridge of the nose. Skin takes on a more noticeable smoothness. Reducing local tension in dermal areas may therefore also improve local circulation and oxygenation of dermal cells. Imperata Cylindrical: Also known as Cogon Grass, is a hearty plant that has demonstrated an ability to survive in a wide range of climates. The plant contains both Potassium and a compound called 3-dimethylsulfoniopropionate (DMSP) which is derived from methionine, one of the essential amino acids. DMSP may help increase inter-cellular osmosis, drawing water into the cells which may remain for several hours. The fact that this occurs, without any heavy compounds which can weigh down or clog the skin, makes Imperata an ideal compound for improving moisture. Consistent hydration may improve cellular metabolism and consequent synthesis of collagen. Directions for use: For optimal results, use Anti-Aging Serum two times a day, alone or under your regular moisturizer. Under-eye imperfections, including puffiness and fine lines, are one the major perceptible signs of stress, aging, and the tendency of most people to burn the candle at both ends. Many products on the market may offer some benefit to improving the skin’s appearance under the eyes. But, Skin So Loved Under Eye Serum is unique in offering clinically researched benefits. Under Eye Serum is a unique and easy to use topical treatment designed to deliver both immediate and longer lasting benefits. Upon application, users will experience a noticeable tightening effect that can last for several hours, along with a definitive skin firming effect when used consistently over time. Short term effect: Ingredients in Under Eye Serum form a thin film on the skin, exerting an instant perceptible tightening effect. Long term effect: Ingredients in Under Eye Serum act as a protective shield against oxidative stress, help to promote the formation of collagen I, which is an essential part of the skin’s connective tissue, and provide a long-term firming benefit when applied regularly. Under Eye Serum ingredients also serve as framework for structural proteins and skin cells, and as filler, providing mechanical cushioning by holding moisture. Under Eye Serum provides both an immediate experiential action as well as an observable change in skin tone. There is a rapid revival of the skin under the eye that includes not only tightening but also smoothness and suppleness. Under Eye Serum is acts to both tighten and improve elasticity simultaneously. These are two complementary actions occurring that improve benefits synergistically. Clinically researched on multiple skin types, Under Eye Serum is an effective imperfection-fighting solution. It helps the restore hydration, texture and firmness to the skin. Under Eye Serum is formulated with clinically tested ingredients and proprietary delivery technology exclusive to Skin So Loved to help the skin return to a healthy, youthful and stunning look. Quick and Definitive Results: Ingredients in Under Eye Serum exert an instant perceptible tightening effect. The result can be both seen and felt, and persist for several hours. The skin is bombarded on a daily basis with external factors that dry, damage, and irritate. Also, as we age, skin hydration becomes more and more vital. To complicate matters, the modern diet tends to not provide adequate nutrients, and in fact tends to exacerbate deficiencies. All of these items lead to poor skin hydration and subsequent downward spiral in physical appearance. HA Serum is a unique and easy to use topical treatment designed to deliver both immediate and longer lasting benefits. Upon application, users will experience a noticeable softening and smoothing effect that can last for several hours. Skin hydration is immediately improved that can be both seen and felt. HA Serum can and should be used daily to help re-hydrate the skin as a vital component of skin health. HA Serum can be used on the face and any other problem skin areas prone to dryness. Hyaluronic Acid: Hyaluronic Acid serves as a filler between keratinocytes (predominant cell type in the epidermis, the outermost layer of the skin), for nutrient exchange, and as signaling ligand (conveying messages through the skin’s nerve network). HA serves as framework for structural proteins and skin cells, and as filler, providing mechanical cushioning and holding moisture. Regular use of topical hyaluronic acid may help improve skin hydration and elasticity. Magnesium Ascorbyl Palmitate: Is a stable, water soluble derivative of Vitamin C. It is excellent for use in water based topical systems since it is very efficient at retaining potency. Vitamin C is essential for collagen production and also acts as an anti-oxidant to help protect dermal cells from free radical damage. In addition, this form of Vitamin C used topically, because it is stable and more pH balanced, is better for people with sensitive skin who want to avoid any exfoliation action. Bioflavonoids: Vitamin C is almost always accompanied in nature by Bioflavonoids and they work together very synergistically. Bioflavonoids, also known as Vitamin P, delivery complementary actions to Vitamin C including those of collagen synthesis and anti-oxidant protection. Bioflavonoids also are essential to help strengthen capillaries as well as give them elasticity. These actions alone make Bioflavonoids a major ally of supple and beautiful skin. Directions: Use anytime of the day to help supply hydration to the skin. The lips are a unique part of the facial anatomy. They therefore deserve extra special care. 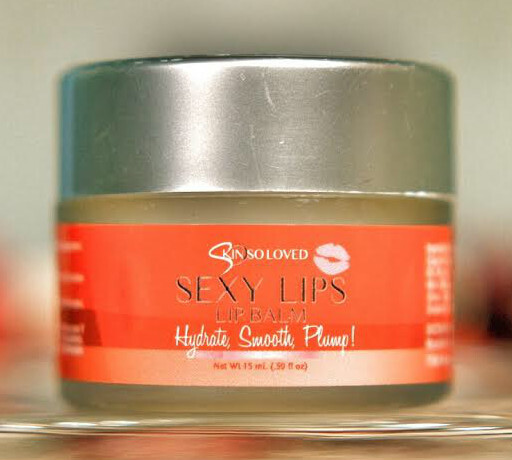 Skin So Loved Lip Balm is a unique blend of ingredients that provide essential fatty acids, phytonutrients, and trace nutrients to re-hydrate and replenish topical oral health. Moreover, regular use can help maintain the health and beauty of the lips. One of the unique aspects to Skin So Loved Lip Balm is its ability to help diminish lines around the lips and bring a plumping effect as well. Lip Balm’s amazing ingredients include Shea butter, royal jelly, sesame seed extract, and hemp seed oil. What sets Skin So Loved products apart from all other skincare brands being sold today? Absorbacore, and its Advanced Delivery Sphere Technology. Produced using a highly specific charged mineral complex, comprised of naturally occurring biologically active macro and trace minerals at precise levels, which are impregnated into and permeate the transport spheres themselves. This complex, derived from organic and ancient sources creates a dynamic, live energetic signature. This not only helps amplify the absorption and bio-availability of enveloped active ingredients, but also provides a direct benefit to cellular physiology. Mineral Ions are infused into each layer of the multi-layered Absorbacore Sphere and therefore are released in a sequential and extended period of time as the food based sphere naturally disintegrates layer by layer on the surface of and below the skin when releasing its nutritional payload. The constant supply of the mineral ions accomplish several things including the enhancement of an electrical gradient needed for nutrient transport, a buffering of pH which naturally improves blood flow and quality, and the minerals themselves, through specific processes, help improve stability of the Absorbacore Sphere. Absorbacore has been clinically researched and shown to positively affect permeation and duration of activity of active compounds. Absorbacore is compounded with all GRAS (Generally Recognized As Safe) Ingredients. Absorbacore spheres envelope a multitude of active and synergistic compounds at a uniform particle size. This helps them to be delivered simultaneously upon application. This phenomena leads to more optimal efficacy. The unique and proprietary processing of Absorbacore allows the ionic minerals to be stabilized within the phospholipid matrix while also creating a sustained release of ions in unison with release of active compounds. The Absorbacore spheres create a sustained release effect thereby allowing active materials to more thoroughly penetrate and act for longer periods of time. This also helps to ensure optimum benefits. Is Absorbacore Technology used in every product? Yes, the Skin So Loved proprietary delivery technology is incorporated into each formula to enhance permeation of active compounds and also to help increase bioavailability to dermal cells. Are Skin So Loved products easy to use? Yes, they take only seconds to apply to the skin and absorb quickly. The skin is dry to the touch within minutes. Skin So Loved products are very safe when used as directed. They are produced under strict lab conditions and each batch is tested for purity prior to shipping. The individual ingredients are well known and safe and each provide strong benefits and have been in use for many years. The formulas contain no coloring agents, no aromas, and no known allergens. When used according to directions, a container of any of the Skin So Loved products will last a month or more. The containers should be stored at room temperature away from heat or moisture. How often and when can I use the differing formulas? Each of the products can be used daily to provide both short term and cumulative benefits. For immediate results, use anytime of the day or night, and because of the fast acting benefits are excellent for use prior to going out during the day, or for the evening. Please follow the specific directions for use on the labels of each of the different products. Are there any special tips for using the Skin So Loved products? For the airless pumps, just press down the top pump until the serum appears on the dispenser tip. Take the serum from the dispenser tip with your finger and apply. Gently rub in the serum to the skin for a couple of seconds and then allow it to absorb in fully. Can I wear makeup over the various products? Yes. As soon as the application of specific product is dry, makeup may be applied to that area of the skin.